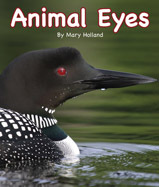 With realistic photos of what eyes look like from a variance of animals, Animal Eyes educates young readers on the function of eyes and how they benefit different animals. 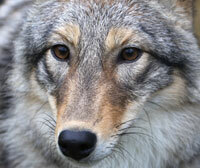 For instance, readers learn that a coyote's eyes are located in the front of its head because it is a predator. Other animals and critters featured include hawks, dragonflies, snakes, and more. The 'For Creative Minds' section in the back of the book further educates and gets children excited to know more about eyes. There's Animal Vision Fun Facts, a vision glossary, and a matching game. Animal Eyes is a January 2015 release by Arbordale Publishing. One person will win a book copy of Animal Eyes. Owls are one of my favorite. I like penguins! Not saying I want one, but they are oh so cute! I am partial to cats, especially my cat Cheeto. He has beautiful orange eyes. The giraffe is one of my favorite animals. Lions and Tigers are some of my favorite animals! This was difficult because I like all animals. One of my favorites is the snow leopard. Thank you for the giveaway! I love polar bears and all bears in general. Wild animal favorite - pandas. I love peacocks, for their beautiful feathers! One of my favorite animals is the giraffe. Bear are my favorite animals.